I don’t live next to this person, but I sort of wish I did. 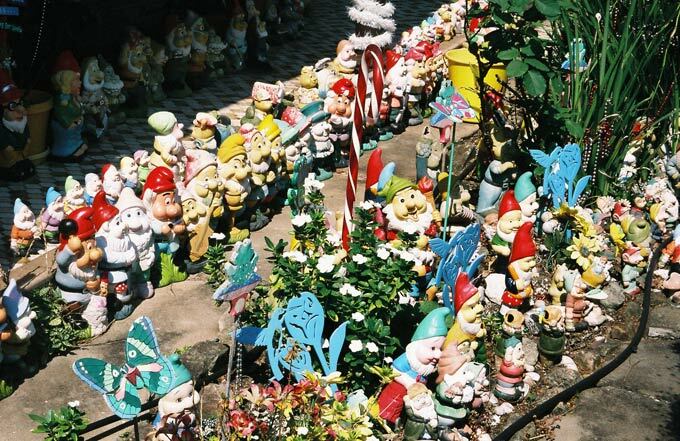 So, loo this woman has such a surplus of garden gnomes that it’s standing room only! Those little guys in the back are actually positioned wee-garden-gnome-shoulder-to-shoulder. And I love the random candy cane in the center of the photo that probably should have been removed months ago – but let’s be honest, it adds to the charm of this wee Garden Gnome Conference. And let’s be honest again, because of the chaotic visual eye pollution it can be assumed that the Garden Gnome owner was more than likely not able to actually see the candy cane let alone remove it. I will have this one day. Mark.my.words. So, who wants me to move back to the States and be their neighbor? *For some reason I envision that the Gnome Owner is a woman who “parents” about 102 cats, names each and every one of her gnome “children” and collects used yogurt lids. « Ladies Lunes: The one’s almost 3 and the other one is almost 16 months.